Long Beach, CA beaches have some different characteristics from many other Southern California beaches. First, they are protected by the breakwater that protects the harbor, so there are no surfable waves. This makes them safer for kids and people who can't swim and great for activities like windsurfing, kiteboarding, kayaking, and fishing from small boats. It also means that there's no wave action to clean out contaminants that pour down the LA River. The contamination problem has decreased significantly since they added booms and filters at the mouth of the river, but it still makes sense to check the water quality reports before swimming. In addition to the river runoff, you can occasionally see a black film of petroleum on the sand from the oil drilling on the three oil islands off the coast. They are somewhat camouflaged with concrete towers and fountains, but they are still pumping oil. Beyond the oil islands, on a clear day, you can see Catalina Island, which is reachable by ferry. Another distinguishing factor of the ocean-front beaches in Long Beach is that they are south-facing instead of west-facing. This means that you have to head south to get to the beach. Heading west will take you to the Port of Long Beach. The southern orientation also means that the sun doesn't set over the beach in summer. If you're on the beach, the sun will set over downtown. However, in the winter, when the sun sets further to the south, the beach and the bluff above the beach are great places to watch the sunset behind the Queen Mary. Not all of the beaches in Long Beach are on the ocean. Some are on inland waterways that are even calmer. Separate bike/skate and pedestrian paths run the length of the ocean-facing beaches from Downtown Long Beach to Peninsula Beach, where a boardwalk continues in front of the houses. In addition to seasonal retail bike rentals, multiple Long Beach Bikeshare hubs are located along the beach. You can reserve bikes in advance online or via their mobile app, or rent on site. Bikes can be returned to any Bikeshare Hub, or for an additional fee, locked to any public bike rack in town. 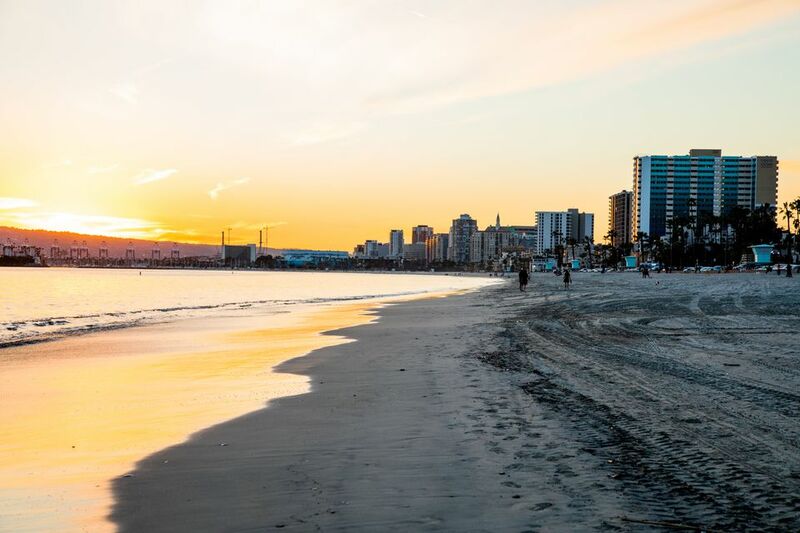 The beaches are listed here from Downtown Long Beach in the west, east to the Orange County line (where the coast continues with Orange County beaches), and following the water inland to beaches on inner bays and lagoons. Alamitos Beach is a sandy beach south of Ocean Blvd, at the foot of Alamitos Avenue where it becomes Shoreline Drive. The beach has a backdrop of downtown high-rise buildings to the west and a high bluff with condos and apartment buildings along most of its length. At the western edge of the beach is a rocky breakwater that outlines the Shoreline Marina. The beach bike path continues west along the breakwater to Shoreline Village. The beach itself runs east, technically all the way to Belmont Veterans Memorial Pier, but the section east of Cherry Ave, known as Junipero Beach, will be covered in the next section. So the amenities here only refer to what's available from Alamitos Ave to Cherry Ave.
Alamitos Beach is easily accessible by bike and has bike racks in the parking lot as well as access to the beach bike path, which cuts across the middle of the sand as far as Peninsula Beach, where it cuts inland to cross the 2nd Street Bridge to continue on the other side of Alamitos Bay into Orange County. There is a small metered parking lot off Shoreline Drive just south of Ocean Blvd. There are metered parking and limited free street parking on Ocean Blvd and side streets, but it's a dense residential area, so it's very limited. There is a Pay and Display lot at the Shoreline Marina that runs right up to the end of Alamitos Beach (be careful not to park in the Marina permit holders section). If you're biking, you can also park in the hourly pay lot at Shoreline Village, but it's not convenient to the sand if you're walking. The huge Convention Center/Sports Arena parking lot is just across Shoreline Drive and there's a staircase at the northeast corner of the lot that brings you up to Shoreline Drive across the Alamitos Beach lot and entrance, but that section of parking isn't always open. Note: This end of the beach parking becomes inaccessible during the Long Beach Grand Prix each April, as the track runs in front of the parking entrance. Long Beach Transit buses 21, 22 and 121 stop at Ocean and Alamitos and several other stops along Ocean. The Metro Blue Line 1st Street Station is about 5 blocks from the beach parking lot. Torrance buses 3 and R3 run from Redondo Beach to Long Beach with a stop at 1st and Long Beach Blvd. There is level beach access from the parking lot at Shoreline Drive and Ocean Boulevard. There are stairs to the beach from street level at 2nd, 3rd, 5th, 8th, 9th, 10th, 11th, and 14th Place. At 11th Place, there's also a boat launch ramp down to the sand. Restrooms: Permanent buildings at Alamitos/Shoreline lot, at 8th Place and in the Shoreline Marina parking lot. Other: Movies at the Beach are sometimes scheduled on Marina Green right next to the end of Alamitos Beach in summer. Alamitos Beach hosts the Regional and National Collegiate Volleyball Championships in July during the Long Beach International Sea Festival. Junipero Beach is a section of Alamitos Beach in Long Beach, CA that begins at the parking lot at the foot of Junipero Avenue and stretches east to the Belmont Veterans Memorial Pier. Some people call it Cherry Beach, probably because they can't figure out how to say Junipero, which is (mis)pronounced locally as "Wahnipairo," with the accent on "pair," and Cherry Avenue also ends at the bluff above the beach parking lot. The personality of Alamitos Beach changes at Junipero Beach where the buildings directly on the bluff end and Bluff Park begins, giving walkers and drivers an open view of the ocean from the top of the bluff. Bluff Park runs from Cherry Avenue 10 blocks east to S 36th Place. At the beginning of Bluff Park, above the parking lot between Cherry and Junipero, Bixby Park extends the green space another 3 blocks inland, providing additional park amenities. This is the only area along Bluff Park that has a wheelchair/bike ramp from the bluff down to the beach. There are free (donation based) daily outdoor yoga classes at Bluff Park right at the top of wheelchair ramp above the parking lot. The bluff walk along the length of Bluff Park is a popular place for people to walk their dogs since dogs are not permitted on this part of the beach. Bikes, skates, and skateboards are not permitted on the bluff walk. The beach itself is 30 to 40 feet below the bluff with stair access about every other block. For most of its length, it's a wide, sandy beach with no waves due to the breakwater. Right in front of the parking lot, it's just a narrow stretch of sand, since the parking lot is on the beach. There are a variety of amenities including beach chair and umbrella rentals near the parking lot that make this a very popular beach for families in summer. The Long Beach Lifeguard Headquarters is at the west end of the parking lot at Junipero Beach. There's are also public restrooms, an outdoor beach shower and a Bikeshare hub at the west end of the parking lot. There is a metered parking lot at beach level at the foot of Junipero Avenue, and metered parking on the ramp down to the parking lot. There is also free street parking along Ocean Blvd at the top of the bluff (3 to 4 flights down to the beach). There are two handicapped parking spaces in the lower lot next to the Lifeguard Headquarters and restrooms. There is level access to the sand from the Junipero parking lot. There are a wheelchair ramp and stairs from street level to the parking lot and beach right next to the ramp down to the lot at Junipero. There are five beach stairways of three to four flights each about every other block between Junipero and Redondo Ave. There are steep bike ramps along the side of the stairs to help walk your bike up and down the stairs next to you. Restrooms: Permanent buildings at both ends of the Junipero parking lot and at Coronado Ave. Gymnastics equipment: Not on the beach, but there is fitness equipment around the perimeter of Bixby Park above the beach between Cherry and Junipero. Other: Long Beach Museum of Art is on the bluff near the east end of the Junipero parking lot (they have their own parking off Ocean). Claire's Cafe at the museum has a great view of the beach. The museum is free on Fridays. The stretch of sand from the Belmont Veterans Memorial Pier to the Long Beach Peninsula is all technically Belmont Shore Beach, adjacent to the Belmont Shore neighborhood in Long Beach, but it has multiple names and characteristics, so we're splitting it into it's smaller components. The main Belmont Shore Beach is the area around the pier. The bluff suddenly disappears; amenities and parking are at beach level and the neighborhood of Belmont Shore is pretty much level to the beach. The pier is primarily a fishing pier, although it hosts a number of on-pier festivals and events throughout the year. There is an hourly parking lot on the east side of the pier between the pier and the construction site for the new Belmont Plaza Pool building. There is a much larger metered parking lot on the other side of the pier that stretches from Bennett Avenue to Granada Avenue. There is also free street parking on East Ocean Blvd. Long Beach Bus 121 from Catalina Landing and Downtown Long Beach to Belmont Shore stops at Ocean and Termino near the pier. Beach access is level from either parking lot or from some parts of the street. The parking lot is walled to protect cars from blowing sand, so there are access points cut out of the wall. Some of these have stairs to get up and over the wall. Bikeshare Hubs at 39th Street and near the pool at Olympic Plaza and Bennett Ave.
Belmont Memorial Pier and the surrounding beach host Pier Daze Pirate Invasion and the Kids' Fishing Rodeo during the Long Beach International Sea Festival every summer. Granada Beach is the part of Belmont Shore Beach in Long Beach at the east end of the parking lot near the Granada Avenue small boat launch ramp. Twenty years ago people didn't really distinguish Granada Beach from Belmont Shore Beach. A couple things have changed that. One is the creation of Rosie's Dog Beach, named after the late bulldog of community activist Justin Rudd, who successfully lobbied for the creation of the dog beach. Another contributing factor is the number of annual events that now take place around Alfredo's Beach Club at the Granada Avenue launch ramp that identify themselves as taking place at Granada Beach. These include movies on the beach, the annual Sandcastle Competition and the 4th of July Bike Parade. Granada Beach is considered to be the area from Roycroft Avenue east to about LaVerne Avenue, which is from the middle of the Belmont Pool parking lot to the middle of the LaVerne parking lot. It's a wide, flat, sandy stretch of beach with parking lots at either end. Nearby homes are at beach level across Ocean Blvd. The beach bike and pedestrian paths snake across the middle of the sandy beach. Most of the activities at Granada Beach are accessible from the Granada Beach metered parking lot, which you can access from the entrance at Bennett, near the Belmont Plaza Pool or at Granada Ave at the opposite end. Most events take place at the Granada end near the paved launch ramp. Stay more in the middle of the lot for the dog beach. There's another smaller metered lot at Laverne, a few blocks east (I've seen Animal Control officers out warning dog owners not to enter the beach from here). There is also free street parking. The nearest bus stop is Bus 121 over by the pier. There is level beach access from the parking lots or some level and some stair access from the street. Granada Beach hosts Movies at the Beach, the Great Sand Castle Competition and the Tiki Festival during the Long Beach International Sea Festival every summer. Peninsula Beach in Belmont Shore is the stretch of sand along the Peninsula in Long Beach from the parking lot at 54th Place where the bike path ends to the breakwater at the Alamitos Bay Channel at the end of the peninsula, looking across the channel and the San Gabriel River at Seal Beach in Orange County. As the bike path curves north around a parking lot to the street at 54th place, the beach takes on a new personality as a narrower strip of sand running along the Seaside Walk wooden boardwalk in front of a row of beach homes and apartments. Seaside Walk ends at 69th Place, so you have to shift over to Ocean Blvd for the last couple blocks to the end of the peninsula at the tiny Alamitos Park next to the Alamitos Bay Yacht Club. The west end of Peninsula Beach where it joins Granada Beach is the preeminent spot in Southern California for learning kiteboarding since there are no big waves. Rentals and lessons are available from Captain Kirk's Kiteboarding and a couple other licensed vendors near the Claremont Place launch ramp. It's also a popular spot for windsurfing and stand-up paddleboarding. There is a parking lot at the beginning (west end) of the peninsula with entrances at Claremont and at 54th Place and another two metered parking lots at the east end of the peninsula at 72nd Place where Ocean Blvd dead ends. There is also some free street parking on Ocean Blvd and the tiny side streets. Level access from parking lots or street parking. Restrooms: Portable toilets at the Claremont Place Launch Ramp and at 72nd Place. Volleyball courts: Yes, west of Claremont Place at the Granada Beach border and a couple random nets along the peninsula. Picnic facilities: There are picnic tables at Alamitos Park at the very end of the peninsula. Bikeshare hubs at 54th Place on both the ocean side and the bay side. At the end of the Peninsula, you're looking across at Seal Beach, which is the beginning of the Orange County beaches, however, Long Beach has several more beaches on inland bays and lagoons. The Long Beach Peninsula is a very narrow strip of land that shelters Alamitos Bay from the Pacific Ocean. The Long Beach Peninsula is only about a block wide, with that width split down the middle by Ocean Blvd. Peninsula Bayside Beach or East Bayshore Beach is the inland side of the peninsula. The beach is a very narrow strip of sand separated from the concrete Bayshore Walk by a low concrete wall. Bayshore Walk runs between the homes and the beach from Balboa in the west to 67th Place in the east. At either end, you have to walk a couple blocks on Ocean Blvd. There are a couple of little pockets of marinas along the beach and the homeowners on this side often have kayaks, small sailboats or other small vessels parked on the sand in front of their homes. The beach looks north to the luxurious homes on the south side of Naples Island. The big island actually has two baby islands - one that is completely in the middle, surrounded by the big island, and another tiny chunk at the southwest corner called Treasure Island. The islands are densely populated with waterfront mansions, and the canals between the islands are lined with yachts and other water vessels. On a clear winter day, you can see the San Gabriel Mountains in the distance beyond the homes on Naples Island, sometimes even with snow. The channel itself is the entrance to the Alamitos Bay Marina and Yacht Harbor, so there's a lot of traffic on the water. In addition to the motorized vehicles and sailboats, you'll see kayakers, windsurfers, stand-up paddleboarders (SUPs), rowing teams, hydrobikes, and of course, gondolas plying these waters. Peninsula Bayside/East Bayshore Beach is a popular spot for people to put in kayaks, SUPs, and other personal watercraft because there's not a lot of sand to traverse between your car parked on the street and the water. If you don't have your own, there's a kayak rental concession at the curve where East Bayshore Beach along Ocean Blvd curves north to West Bayshore Beach/Horny Corner along Bayshore Avenue. At that same corner is the Leeway Sailing Center which offers a variety of sailing, kayaking and canoeing classes (and rentals to those who have taken classes), and Bayshore Park, which has basketball, street hockey, and a playground. The building on the water in front of the Seaway Sailing Center is Gondola Getaway, which offers gondola cruises of the Naples Canals and Alamitos Bay. This is all near the intersection of Ocean Blvd and 54th place. There is a metered parking lot next to the Leeway Sailing Center that has the most direct beach access to Peninsula Bayside/East Bayshore Beach. There is also a parking lot at the beginning (west end) of the ocean side of the peninsula with entrances at Claremont and at 54th Place and another two metered parking lots at the east end of the peninsula at 72nd Place where Ocean Blvd dead ends. There is also some free street parking on Ocean Blvd and the tiny side streets. Street parking and parking in front of Leeway Sailing Center is closest to the Bayside Beach. There is level beach access through breaks in the wall from the Leeway metered parking lot. From street parking further down the peninsula, access is down the short side streets and up and over a few steps to get you over the break wall. Restrooms: There are restrooms at Leeway Sailing Center during business hours, portable toilets are across Ocean Blvd at the Claremont Place Launch Ramp and at 72nd Place. Swimming: Yes, there's a roped off swimming area. Inner Peninsula/East Bayshore Beach hosts an annual water polo competition during the Long Beach International Sea Festival every summer. West Bayshore Beach along Bayshore Avenue in the Belmont Shore neighborhood of Long Beach is more commonly known as Horny Corner. During the summer months, this stretch of Bayshore Ave is closed to traffic and this little inland stretch of beach becomes one big beach party. There's no alcohol permitted on the beach, but it has a long history as a singles beach. Some of those singles have grown up and now bring their kids here, so it's not quite as much of a meat market as it once was. This little strip of sand sits right up against Bayshore Avenue and faces southeast into Alamitos Bay. It looks across at the mansions of Naples Island. At the south side of the beach, where it meets Peninsula Bayside/East Bayshore Beach are Bayshore Park, the kayak rentals and Leeway Sailing Center mentioned on the previous page. At the north end of the beach is the Belmont Shore Branch Library, 2nd Street Bridge to Naples Island to the right and the strip of 2nd Street Restaurants and shops west through Belmont Shore. There is also a Bikeshare hub at that corner. Long Beach Bus 121 and 131 stop near the north end of Bayshore Beach at 2nd Street and Bayshore Ave. There is a low wall between Bayshore Avenue and the beach; access is up and over a few steps through the wall from the street, or there's level access from Bayshore Park. Bikeshare hub at 2nd and Bayshore at the north end of the beach and at 54th Place and E Ocean at the south end. Alamitos Bay wraps around Naples Island in East Long Beach. 2nd Street crosses the island from Belmont Shore, exiting the other side at Marina Pacifica. There's also a bridge onto the island at Appian Way along Marine Stadium. Where Appian Way crosses onto Naples Island is Mothers Beach (also known as Marine Park Beach or Marina Beach), a northeast-facing stretch of sand at Marine Park. Mothers Beach is part of Marine Park in the northeast neighborhood of Naples Island. It's surrounded by a grassy area. There's also a children's playground right on the sand. The shallow swimming area is roped off from the rest of the bay. The right corner of the beach is used by the Kahakai Outrigger Canoe Club. There's a metered parking lot at the park or free parking on Appian Way. Long Beach Bus 121 and 131 stop on 2nd Street a couple blocks away. There is level beach access via paved paths from the parking lot or you can walk across the grass. Mother's Beach is a popular spot to watch the annual Naples Christmas Boat Parade, although you can only see the big boat parade from this location. Across Appian Way Bridge from Mother's Beach at Marine Park is Marine Stadium, a long stretch of water used for rowing competitions and commercial boat races. A fenced parking lot runs most of the length of Marine Stadium separating the houses from the water. There's a small stretch of sand that separates the smaller parking lot at the east end of the Stadium with the parking lot with the longer parking lot at the northwest end. There's a boat launch ramp at the edge of the east parking lot. This really isn't a beach where you go to sit on the beach, but people do set up their umbrellas and beach chairs on the beach to watch friends and family rowing, water skiing and doing other water sports on the water. The bigger parking lot at the west end is used for a farmers market with food vendors and live music on Wednesday afternoons. The closest entrance to the beach stretch is at the east end of Paoli Way near Bayshore Avenue. There's an entrance to the longer lot at the other end of the stadium at the opposite end of Paoli Way near Nieto Avenue or E 3rd Street. The nearest bus stop is a block from the west end of Marine Stadium at Appian Way and Nieto Avenue. There is level beach access from the parking lot. Marine Stadium hosts the annual Dragon Boat Festival and outrigger canoe races during the Long Beach International Sea Festival every summer. The water from Alamitos Bay in Long Beach goes underground at the end of Marine Stadium and comes back out to form a wetlands habitat at Colorado Lagoon. The small lagoon has a pocket beach with a shallow swimming area and a playground on one side and wetlands on the rest, attracting a variety of wetlands birds. There's a Wetland & Marine Science Education Center and a Model Boat Shop that's open for 6 or 7 weeks in the summer. There's a metered parking lot at on Appian Way and Colorado St or street parking. Long Beach Transit Bus 151 makes stops on Appian Way at Park and at Nieto on either side of Colorado Lagoon. There is level beach access adjacent to the parking lot. Colorado Lagoon hosts the Model Boat Regatta during the Long Beach International Sea Festival every summer.